The Sound Quality is good with nice bassy tones but the down side is the DB levels are pretty low. You will have to turn the volume up some. The Picture Quality is goo, Sharp but not crazy sharp. Colors pop but the film is more of a dark grungy film so not much color. 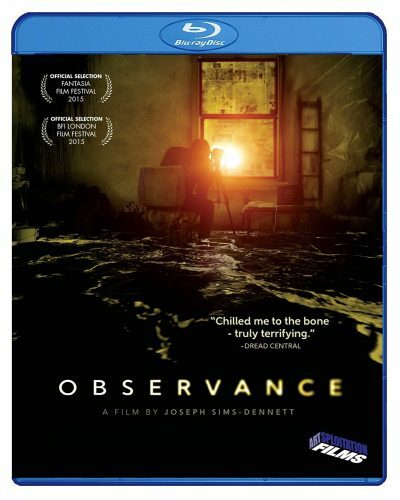 Observance is an Ambient Horror Mystery Thriller with David Lynch Esq Shots. A Story that is weird and out their and by the end you still don’t know what the hell just happened. Is this a Psycho film? a Possession Film, A Witch Film? It’s a Story line that leads are main into a different dark world. He is hired by a guy who has a Client who needs this Girl Watched. To Find out what ever he could. Majority of the film that’s what happens. He watches, He taps her phones, He breaks in to lay some mics around. he stays steadily looking out the window to take photos. But it gets twisted, well we slowly see things go weird. Weird noises, he pucks up the black stuff and by the end we are into a Horror film. Or I should say We a left at the end still wondering what the hell happens. Story wise the film is slow but that’s the way it should be when on a stake out. We slowly get weird noises and sounds through out. We also get flash backs or dream shots that have a very David Lynch feel to it. A Brother Who may or may not be dead. I Don’t know but I have to say I Enjoyed it. Its creepy but I can see how this film wont hit most viewers. If your into a Horror Mystery with A Ending that still keeps you trying figure it out then you should give this a shot. Overall the film was a good watch very Ambient like and it matches the weird steady Bass tone we get in this film. Some cool looking shots and feels. Pretty dark and Grungy at times. The film gives you a bit but leaves a ton out leaving trying to piece whats going on. Like Are Male lead finds this animal head in the basement with his chain on it? Blood all over the place. What the hell is that? If you like puzzles then you might like this film. With that said I give this film a 4 out of 5. It has some down sides but mostly I like the tone and the Mystery behind it. Give it shot .